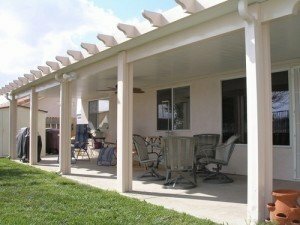 Why Should You Choose Ultra Patios for Patios Covers in Las Vegas? Summers in Las Vegas can be unbearably hot, so having a way to keep the sun’s burning rays off your back is always welcome when spending time outdoors. Whether you’re grilling, swimming, entertaining company or simply relaxing outside, Ultra Patios provides quality patio covers for Henderson, NV; Anthem; Summerlin; and North Las Vegas residents. Ultra Patios has been serving residents in and around Las Vegas for over three decades, so we have a vast base of experience in the industry. This, in addition to our commitment to the highest level of service to our customers, allows us to provide quality patios to residents throughout the area. Family owned and operated: There is no dealing with subcontractors when you call us for your project. 100% Satisfaction Guarantee: Your satisfaction is our chief priority. We take a great deal of pride in our work, and we want to make sure that you are completely satisfied with your new patio cover. Lifetime warranties: Our work comes with a transferable lifetime materials warranty. Member of the Better Business Bureau: To be a member of the BBB, a business must be free of patterns of complaint and have all necessary licensing in order. Thus, BBB members are trustworthy businesses that make sure their customers are served as well as possible. Superior workmanship: By using the best materials available and maintaining a discerning eye for quality, we strive for the finest workmanship when constructing your patio cover. Our business is licensed and bonded. Additionally, we are an official dealer for Alumawood and Elitewood. We promise quality and satisfaction in our work, so when you need patio cover installation from a trusted source, call us. By using high-quality Alumawood and Elitewood patio covers, we give you the very best patio installation and design available. Our patio covers are long-lasting, totally weather resistant, and able to withstand heavy gusts of wind while providing UV protection. They also do not fade, chalk, rot, peel, or rust, so you can enjoy your shade for years to come with minimal maintenance. Lattice covers, which can reduce sun exposure by as much as 60% while allowing cool breezes to come through and plants to grow. Solid covers that provide maximum protection from sun and rain. Freestanding covers to shield various leisure areas around your home. Insulated covers that reduce temperatures by as much as 15 degrees and provide added strength. Each cover is designed and built for optimum strength and aesthetic effect with textured wooden finishing and a wide variety of colors and styles. Also, our materials are made in the USA. For a low-maintenance patio cover that will keep the sun off year round, you can trust Ultra Patio to do the job well. Whether you opt for a freestanding lattice cover or a solid insulated patio roof, we guarantee our work 100%. Since we are family-owned and operated, we are able to help you at all stages in the process, from purchase to design to every point throughout construction. You don’t have to deal with subcontractors or cumbersome lines of command that get in the way of obtaining real assistance. In a hot, sunny place like Las Vegas, patio covers are almost a necessity, but they can also be a bit pricey. At Ultra Patios, we offer financing options as well as senior and military discounts. There are many options in Las Vegas for patio covers, but not all of them offer the same level of family-owned quality and personal service that we do. With our commitment to the highest standard of professionalism and customer service, you can be sure that our work will be completely satisfactory. For a free in-home estimate or answers to any questions or concerns, contact us at (702) 463-8252 or simply fill out the form on this page.